Sunrich Naturals is a US-based food and beverage manufacturing company, and is a subsidiary of SunOpta, Inc. The company has its headquarters in Minnesota, USA. Sunrich Naturals was created by its parent company SunOpta over 25 years ago. The company focused on creating products that were both wholesome and organic, without a trace of artificial ingredients. The company believes that good and healthy food starts with a good and healthy earth. This belief guides Sunrich Naturals in the way it handles and processes its grains, in the way it produces its products and in the way it works with farmers. For more than 25 years, Sunrich Naturals has been working with family farms in the United States in order to create natural and organic food products for consumers in the country. These farmers have been working the land for over a hundred years and are therefore committed to continuing the practice of organic farming. Over the years, Sunrich Naturals has become experts in creating shelf-stable non-dairy beverages. The company currently produces more than 150 million quarts every year, both for its own brand and for other brands as well. Even though the company has continually focused on producing high-quality products for other brands, it has also recently started producing products under its own label, Sunrich Naturals®. Under SunRich Naturals®, the company produces and markets beverages (natural and organic), roasted snacks (natural) and frozen vegetables (non-GMO). 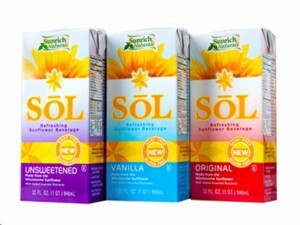 Under the brand’s beverage line is SōL, a non-dairy beverage made from pure sunflower kernels. Sunflower is considered one of Mother Nature’s most powerful super foods. The beverage offers 50% of the recommended daily requirement of vitamin E, which is an important antioxidant needed by the body. Aside from being dairy-free, SōL is also gluten-free and has three variants: vanilla, unsweetened and original. Under the brand’s line of roasted snacks are its soy, corn and sunflower snacks. These snacks are made from ingredients that are all natural and free from any genetically modified ingredients. These roasted snacks are also a very good source of protein and are a good substitute for meat. Under the brand’s frozen vegetables line is shelled Edamame. The soybeans are harvested and packed sweet and young. Consumers can choose between shelled Edamame and those that are still in the pod. These soybeans are perfect for salads, stir fry and pasta. It can also be a healthy snack. Ownership Type: A subsidiary of SunOpta, Inc.
Oh my gosh Sol is amazing! I picked some up at my local health food store here in St. Petersburg, FL and especially like the Original flavor on its own. The Unsweetened one is great too and I made a smoothie with it. Really creamy texture and totally delicious!